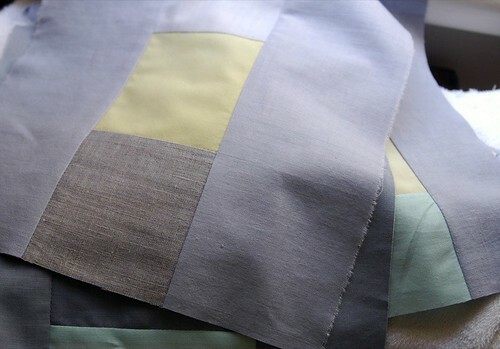 i've been working through quilt blocks for a queen/king size quilt for our bed, using cotton and linen that i've dyed myself in shades of grey/blue, pale pistachio and light turquoise... just need to find that perfect, solid off-white, cotton to finish the top. Oooh- I love the colors. How wonderful that you dyed them yourself! I'm starting to design a quilt for our bedroom as well, but it's a littler overwhelming. It looks great so far, beautiful muted colours. Chic! One of my projects on my to do list is to make a quilt for our bed.. It's going to have to wait, I just realised I forgot to take my sewing machine to get serviced! It looks very exciting! Can't wait to see the finish product! Oh I am in love. You dyed the fabric yourself? How wonderful. the shades are absolutely amazing. I;ve been thinking about dyeing fabrics myself lately. I find nice solids to be ridiculously expensive and hard to find in the shades I want.